The main event for “UFC on FOX 4” has undergone a complete makeover after Brian Stann was forced to withdraw from his scrap against Hector Lombard. On Wednesday evening, it was announced Mauricio “Shogun” Rua (Pictured) will now headline the August 4th show against Brandon Vera. Shogun was initially slated to face Thiago Silva at UFC 149, but Silva had to pull out after injuring his back. Vera is receiving a promotion from his “UFC on FUEL TV: Munoz vs. Weidman” fight with James Te Huna. The organization is currently scouring its roster to find Te Huna a new opponent for July 11th. However, the UFC did not report what they intend to do with Lombard. 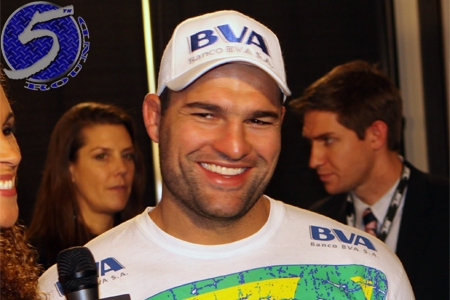 Shogun has alternated between wins and losses over his past six bouts. He was last seen dropping a controversial decision defeat to Dan Henderson at UFC 139 in November. The former light heavyweight champion hasn’t collected consecutive victories since April 2009. Vera is coming off a unanimous decision win over Eliot Marshal last October. Prior to UFC 137, “The Truth” hadn’t sniffed the win column since August of 2009. Staples Center in Los Angeles, California is expected to host the shindig.